Tonight we had another group fitness session with 5 teams together. The U17 boys have not been with us for 2 weeks because many of their boys are in high school soccer and it's a bit much on the body. We had 59 players in total tonight. Another good turnout. Not sure why, but at school today I thought to switch things up a bit. During the first three sessions we had a 12 minute run, 5 sprints and exercise circuits. Today we set up 6 stations around the track. 2 were for 5 pushups. 2 were for skipping (10 skips) and 2 were for 10 jumping jacks. We split the boys up and they ran the track for 30 minutes, stopping to do each exercise. They started in 6 groups but that spread out quickly. We told them to get to the station, do their exercise and go, individually, not as a group. I have to say I was impressed that all the boys made it through the run, and the U10s have a few runners on their team who can keep a nice pace. We followed the 30 minute run with 30 minutes of running with the ball performing various sequences along the way. The tennis courts were organized in 8 rows of 6 cones each and the players were dribbling in and out of the rows eventually making their way back to the beginning. We worked on moving around the cones with the outside and inside of both feet, dribbling with the left and right foot and eventually a free slalom through the cones. 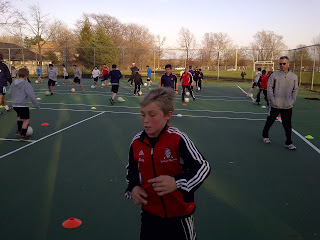 We had a lot of boys moving with the ball and I didn't coach much past a demonstration and offering tips along the way. Our goal tonight was to keep them moving, feed off the energy and get their foot on the ball. They literally had the ball on their foot while running for at least 25 of the 30 minutes. Hopefully the coaches take the turns we were doing and work on them at team training. I have some good turning exercises I hope to share with them soon. I was so happy that it worked out and feedback was good with a few good suggestions. Parents were able to help and our parents who run can join us for a full 30-minute run now. It's great to have parents out. There are things that need to be worked out. We need to put some markers around the track to protect the runners from the track club who are there every Thursday. I also need to appoint a parent to do an accurate head count earlier so we can plan the next part properly. We were short skipping ropes ( in my opinion) but Coach John said he will get a few more. St Mike's Jr Boys - PROGRESS! The last 2 days we have been working the boys a little harder on individual techniques. 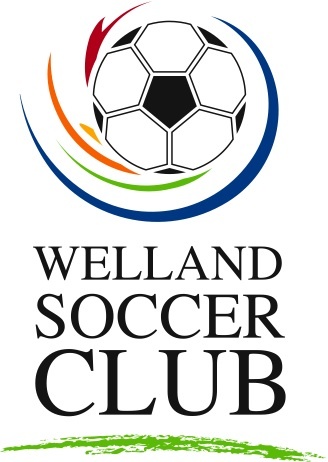 Coach Loris has taken this approach of trying to give these boys as many tools as possible leading to their Grade 11 and 12 years and senior soccer. My part of this has been working on their footwork with the ball, sending them into situations where they need to use the right part of the right foot to make something work, whether it's 1v1 moves or turns or whatever. For some it's new and has been a bit frustrating but they are working at it and coming around one at a time. It's very easy to work with these boys because there is noticeable improvement and they are eager to learn. Our small game at the end of training today was very competitive and really motivated the coaches to continue on this path and patiently molding this group towards the season opener . I am sad that my time at the school is coming to an end soon and I hope to be able to continue helping even though I am elsewhere from day-to-day. Today, the St Mike's Jr Boys had a session after school. I think I am going to enjoy being the assistant at practice for this program. Mr Lucchetta and Mr Luppino are the full time staff teachers who coach the team. Today, Coach Lucchetta's plan was to get to 2v1s. He started with some running and a few passing drills to get the ball on their foot. Coach Luppino worked with the keeper and I took over after he hit 342 balls at him and his thigh turned to mush. I was watching wondering how he was doing it. The boys on this team are great kids, but it's not an overly proficient group when it comes to technique. It's a great opportunity for the coaches to instill the enjoyment of soccer in them and hopefully convert them into more active players. I already have 2 boys in my scope to see if I can't talk them into playing this summer. I see a very rewarding season for this group if they work hard, come to training and show pride in their play. The teacher coaches are good role models for them and younger guys. It went OK and the boys were getting the points. And they were getting chippy and competitive! I love that. He spent a little extra time on that and only introduced 2v1s then let them play 6v6 for the last 10 minutes. I am not sure how long I will be at this school for, but I do look forward to working with this group some more. Our U13 boys convened tonight for a 2 hour session. 1v1 defending was the theme of the night. This is probably the single most weakest point of our team. We started out with a 12-minute run where we asked for a minimum of 1.5 miles followed by five 40m sprints. This is becoming tradition. We moved into a passing-receiving warm-up type of drill and had them receive the ball 4 different ways. Always first touch out of the feet and in a different direction. The last style for receiving was to step on the ball dead, fake the kick and then change directions. As usual, we looked for quick passes. We then did a running-turning-passing drill using 4 different turns. Our coaching focused on the balance in the turn, keeping the ball under control, lifting the head after the turn and making an early pass after the turn. Doing turns only is not good enough because in a game you are always making a pass after the turn. We've been passing, dribbling and turning for months. We'll see how it pays off when he hit the grass. For 1v1 defending we started with straight up 1v1, me against you. One player serves the other and they play. The nets are not square to each other so the players were not running straight forward and defending the target directly behind them. If player turns away from you, don't let him turn forward again. Force him back. if a player won 3 games in a row the other guys in the group did 5 pushups. We then went to a 7v7 game (well, 7v6 we had 13 players). We were looking for players to pressure the ball early and get into 1v1 defending mode. This was working out "OK". To add some intensity we added that if a team scored twice in a row the other team did 10 pushups. So our mentality was if you were looking to score your second goal, you did not want th others to score and tried to win the ball back. If you were the team under threat of pushups you worked to win and keep the ball in possession and score. Anything to make the game competitive is helpful. It's difficult to replicate a game. It was nice to have Coach Paul out tonight and have 2 groups for each exercise. More organization, more pointers and 4 eyes instead of 2 helps make everything easier. The only bad feeling I left with tonight was that the final game was only 20 minutes long. I didn't feel I had the time to step in and make corrections and still leave time to play freely. So we tried to make the game's conditions do some of the teaching for us. The other stuff was going well and I let the clock get away from me. We also ran a bit late, which is not good for parents. Next up is Wednesday. I am probably going to repeat tonight's 1v1 theme with different exercises and a longer game. Plus the 12 minute run.